Avery is a known champion when it comes to developing full-flavored rich beers and their Old Jubilation is no slouch. With it’s big malt profile this Winter Warmer certainly tips the scales on the sweet side of things with flavors of hazelnuts, caramelized sugar, chocolate and roasted malts. This brew actually drinks more like a porter than a winter ale. Appearance: This holiday beer pours a deep, rich mahogany color with good clarity. Has an off-white, creamy, one-finger head that didn’t stick around too long leaving behind decent lacing. Smell: The smell is soft and sweet. Hazelnuts are easy to pick out as are the dark fruits and roasted malts. There isn’t much in the way of spices or hops. There is however a subtle alcohol smell most likely due to the high abv. Initial Taste: Unlike the smell the flavor is in no way subtle. Big sweetness from the hazelnuts, figs and caramelized sugar making a delicious initial flavor. Followed by porter-like roasted malts and bittersweet chocolate. There is a small yet earthy hop presence that helps to cut through the sweetness and round things out with a needed bitterness. Thoughts: Avery is a known champion when it comes to developing full-flavored rich beers and their Old Jubilation is no slouch. With it’s big malt profile this Winter Warmer certainly tips the scales on the sweet side of things with flavors of hazelnuts, caramelized sugar, chocolate and roasted malts. This brew actually drinks more like a porter than a winter ale. There is a nice hop bitterness that helps to balance things out on the finish of this bold beer. As far as winter warmers go this is a very good representation of the style, especially with that high 8.3% abv!. 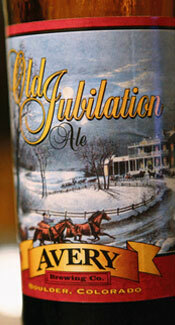 If your a fan of the style I highly recommend Old Jubilation. Happy Holidays.